The second day of the Interchange Festival, The Political Body, yields robust conversation and sharing. In all five sessions I attend from those scheduled, questions and propositions are offered with both candour and care. Morning sessions consider the complexities and political implications of intercultural creative practice. The breakfast session, Mornings are Difficult, is facilitated by Raghav Handa in conversation with Tim Bishop, Rakini Devi and Liz Lea. Handa asks how we might think about protocols that seek to prevent cultural appropriation in performance-making. If we accept that culture is not immutable, and doesn’t exist in an airtight container, then where is the line between “appropriate experimentation” and “appropriation,” as Bishop puts it? Several propositions emerge: one is that intercultural work should, by definition, involve a commitment to deep, extended research and training in all the cultural practices involved. Devi proposes that the term “intercultural work” should describe a methodology, not a product, and that a methodology should come from more than a two-week residency. Other recurring ideas include the crucial importance of genuine respect for collaborators and cultural materials, and the importance of acknowledging when one has has appropriated something, or acted inappropriately. We talk, too, about what materials one can or cannot touch when making intercultural work, and what audience members can or cannot “read” in performances that draw on specific cultural vocabularies. This last question has particular relevance for me as a writer reporting on this day. I am a Dutch-born immigrant to Australia, and my life experience has always been one of white, middle-class, colonial privilege. I am queer, I am cisgender (to my knowledge) and I currently do not identify as having a disability. An awareness of what I might not be noticing as a result of my position comes up again and again throughout the day — and I feel it is important to note it here. Related questions come up in the following morning session I choose, which is a discussion between facilitator Paschal Daantos Berry and artists Caroline Garcia, Amala Groom and Martin del Amo, about how ancestry and a sense of cultural identity inform their practices. Two hours of rich discussion pass quickly. Wiradjuri visual artist Amala Groom explains how spirituality and Aboriginal law live in her body, and how they inform her working method — from instances of spiritual inspiration that reveal the beginnings of a new work she should make, to questions around when she works, and at what pace. This gives rise to a discussion about how one structures one’s time as a performance-maker, and about the decolonising of one’s own working methods as an Indigenous or a Filipino artist working in an environment that preferences what we might call ‘Western’ approaches to time-management. Something Garcia has grappled with is the question of what she can and cannot take, or claim, in relation to Filipino culture. A similar question about what can and cannot be “claimed” has come up for German-born dancer and choreographer Martin del Amo, who confronted the question of whether or not to call himself a Butoh dancer at a time in his life when he had trained extensively in BodyWeather and his work lent itself to associations with Butoh, but he had never been to Japan. The conversation grows to include other people in the room. We work our way into meaty questions. Where does ‘whiteness’ live? When you claim a certain heritage, are you ever at risk of stealing something, or can we say that your ancestry lives in your bones, and that you always get to say who you are? Who in your world receives the authority to establish your mythologies, your identity? Under what creative or performative circumstances can you claim the authority to call something a truth (even if that truth is only a temporary, local one)? After lunch, we move into a presentation by American choreographer Bill Shannon. 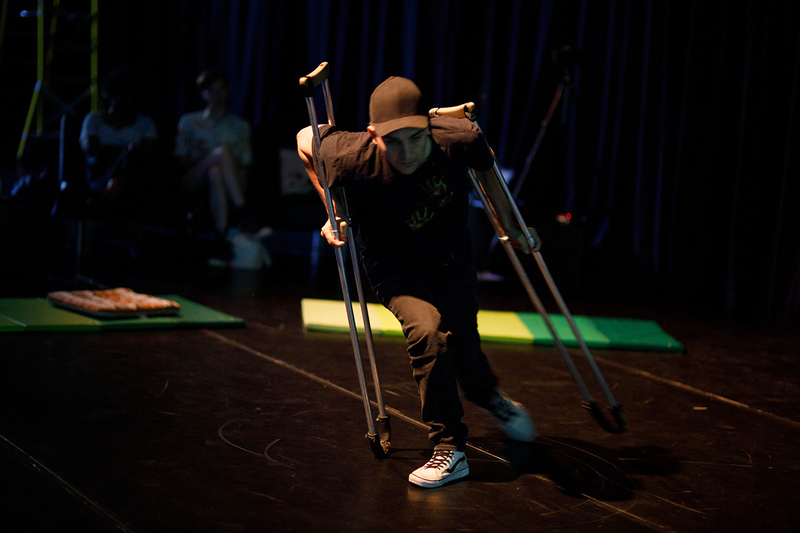 Shannon has moved and danced on crutches since he was young. He talks and dances us through key aspects of his practice, in particular those that relate to the theme of the political body. He discusses the oft-perceived disjuncture between his tools — his skateboard and crutches, often used simultaneously — as the former connotes a radical, transgressive relationship to architecture and the latter tends to be associated with a need to cling onto the built environment, to avoid falling. He speaks about others’ scepticism about his condition; some fellow nightclub-goers, for example, doubt that he actually needs his crutches. Shannon shows us a dance move with which he fakes being a fake, and thereby playfully and transgressively instantiates a shift in power relations, turning himself from the subject of this idea of fakery, into its host. He also introduces the idea of his “condition arriving,” that his “condition” (of being on crutches) always “arrives” in a space before the rest of him does. To many, he is first a man on crutches, and then everything else. Caroline Garcia said something similar earlier in the day: that her body is always already politicised, because it is brown. This notion of the politicised body comes up again in the following session. 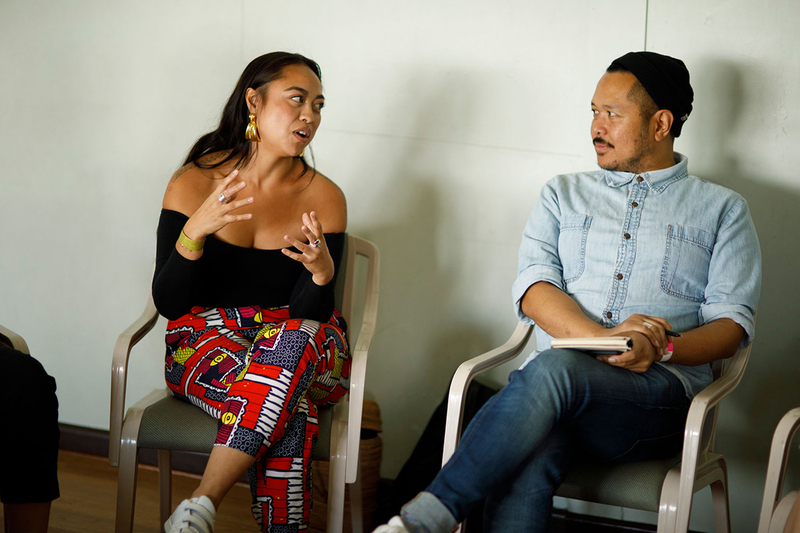 Trans Filipinx-Australian artist Bhenji Ra’s afternoon lecture explores disruption on many levels, the performance itself shaking up what a performance lecture could or should be. Before it starts, we wait outside a closed door until Ra steps out in a shiny, head-to-toe alien costume and casually waves us inside. She sprawls on her belly in front of a laptop, a few other necessities spread about (a book, a phone, audio speakers), and communicates with us through the laptop’s text-to-speech function. As she types, a computerised voice delivers poetic introductory thoughts about disruption and our being here together. The typing takes time, and Ra jokes with us that “today is all about patience.” It feels like we are hanging out in Ra’s bedroom, on her terms. It’s a given that we’ll pay attention, and it’s a given that we’ll take our time. I think of all the cisgender heterosexual white male film directors whose work I was expected to give my time to as an undergraduate student — the many hours spent watching and analysing their films, many of which were, in retrospect, misogynistic — and think to myself that there is literally no one I would rather be giving my time to right now than Bhenji Ra chilling on the floor in an alien suit, suggesting to me via text-to-speech that we listen to her playlist. Later the suit is peeled halfway off so we can see Ra’s face, and she continues to talk, or think out loud, about disruption. She talks about the disruption of heteronormative desire — “how could something as delicate as my Adam’s apple disrupt your desire?” — and describes knowing from a young age that her ethnicity would be disruptive in her rural suburban surroundings. Later, the conversation opens up to include the rest of the room. As has been the case several times today, the discussion is at once forthright and careful. The evening program considers the dancing body’s potential to act politically. Curated by Adelina Larsson, it features works by Rhiannon Newton, Ros Crisp and Bhenji Ra. Sydney dancer and choreographer Newton begins by sharing two scores from her recent work, Bodied Assemblies. Through group improvisations that require listening, collective responsibility and a capacity for working in the face of the unknown, these scores ask both how we can come together and how we can change together. The scores are attempted in pairs, in a group of four, and then, eventually, with everyone in the room — 40 or more people. As we all attempt to change together, the question of how to do that in a wider political sense — and the complexities, the requirements, the difficulty of doing that — begin to become apparent to me. Ros Crisp shares fragments of DIRt, a work in progress that addresses her grief and perplexity at witnessing the environmental destruction of the land she grew up on after returning home from a career in Europe. There are video excerpts; there is a lamp-lit reading (an extended barrage of facts about the devastation of the planet); there are bursts of dancing; and there is Crisp’s distinctive way of talking to us — wonderfully loose, but also precise. Overwhelmed with the question of what to do, and of what (if anything) dance can do about this ecological devastation, Crisp describes a process of “crashing around” — of “crashing back and forth” between dancing and the problem, or between dancing and activism. Crashing around to find, perhaps, a productive relationship between the two. We witness a problem unresolved, and a state of mind very much politically alive. Finally, Bhenji Ra returns to wrap up the day. She slinks into the performance space in the alien suit I saw this afternoon. As she moves on all fours towards and through the audience, she begins to speak, rhythmically. Together, movement and speech (or is it a chant? or a song?) raise questions about power with both humour and a serious, darker edge. 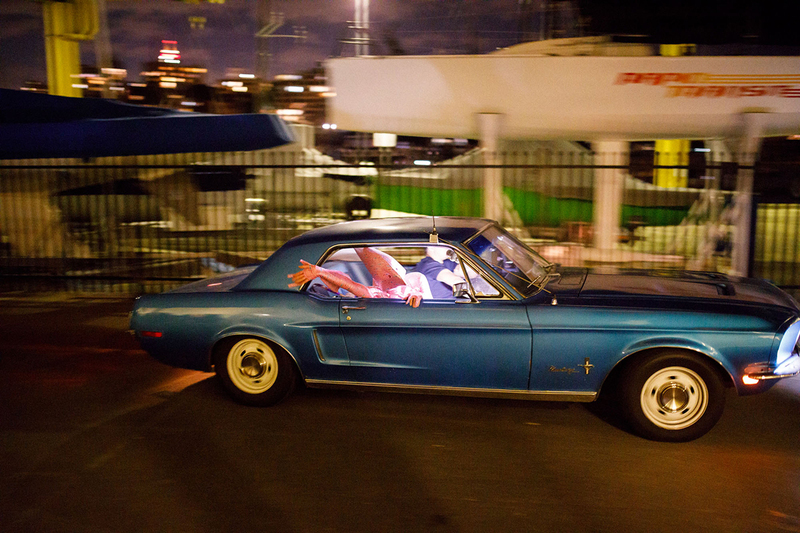 Again, we are in Ra’s space, even as she leads us out of the Drill Hall, through the foyer and into the warm evening, where she disappears into a roaring blue Mustang that tears off into the night. I have been at the Interchange Festival for 12 hours, and I go home not tired, but satiated — full of food for thought. 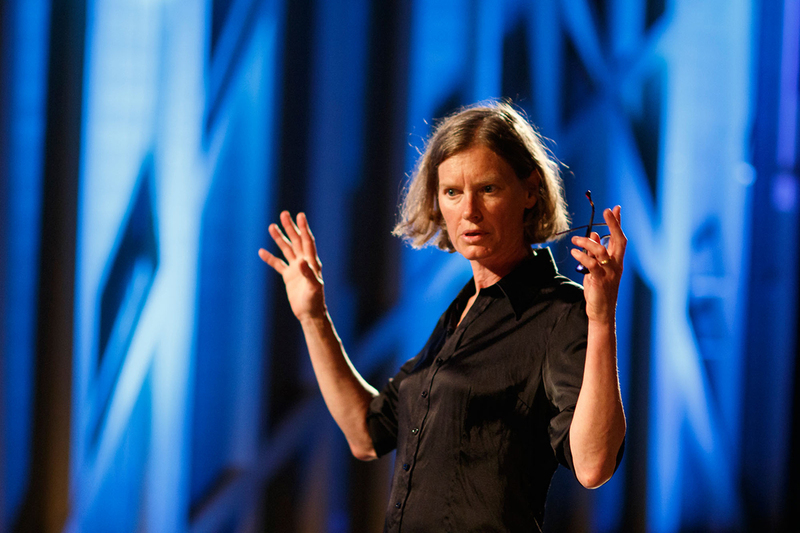 Cleo Mees’ response to Political Body was jointly commissioned by Critical Path and Open City, the publisher of RealTime.